When making repairs in an apartment, we often think about replacing old batteries that have served their time. It is time to put in their place more modern and efficient devices that have appeared on the market. But then the question arises - which heating radiators are better for an apartment? After all, someone praises aluminum batteries, someone - steel. Some neighbors are not happy with the new-fashioned bimetallic radiators, while others have bought new cast-iron ones and are also satisfied. And let's compare these most popular heaters, given some of the nuances of centralized heating. What are the dangers of centralized heating? On the one hand, supplying heat from the outside is more convenient than autonomous heating - you don’t have to worry about installing the boiler and setting it up. Autumn will come, and hot water will merrily run over your batteries, warming the apartment. The water, which has come a long way, contains many chemically active impurities that can cause corrosion of pipes and radiators . And even small particles of sludge, which inevitably fall into the coolant, scratch the batteries from the inside, after a few years rubbing them into holes. And the water temperature is not always stable - the batteries have room temperature, otherwise it is impossible to touch them. And the most important danger is the sudden huge pressure surge in the heating system, the so-called water hammer. It happens, for example, for the reason that the locksmith too abruptly closed the tap of the pumping station. Previously, they used valves with a smooth stroke, and with the advent of ball valves, it became possible to turn off the water instantly. There is a water hammer even when excess air enters the pipes. The second pressure surge can make a lot of troubles. Weak batteries do not withstand enormous pressure and burst, sprinkling boiling water, ruining the furnishings and causing damage to the neighbors below. Now, knowing the weak points of central heating, you can already imagine what requirements a good battery should meet. We list them. 1. For radiators, the pressure declared by the manufacturer must exceed the pressure (both working and one and a half times the test pressure) in the heating system. For example, give the numbers. 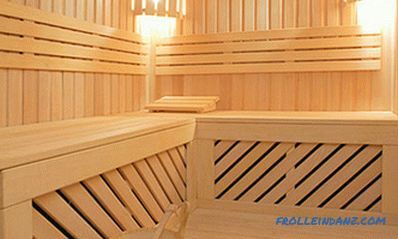 In the five-story houses of the old layout, this parameter is no more than 5 - 8 atmospheres. Modern multi-storey buildings are heated under pressure up to 12 - 15 atmospheres. 2. Separately, we note the ability to withstand water hammer. Because living in an apartment, it is difficult to avoid pressure surges in heating, it is better to prevent trouble in advance. By the way - if you often hear buzz and clicks in batteries, contact your utility bureau. Pressure, you see, "naughty" in the system. 3. The quality of water in the domestic heating system is unimportant, so the batteries must with honor endure its "chemical attack" without disrupting. 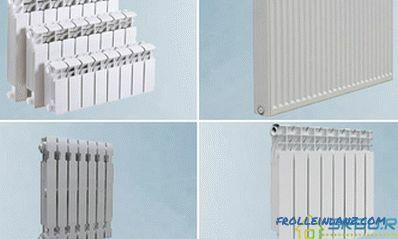 It is necessary to use radiators with a special coating on the inside or a chemically neutral material for the walls. And their thickness must be such that the sand particles and small pebbles do not rub it, acting like sandpaper. 4. 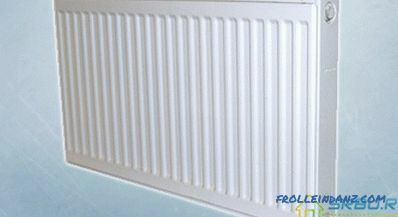 Deciding which radiators are better for an apartment, let's not forget about their main function - to warm. That is, it is preferable to choose appliances that have higher heat output. 5. We will not ignore the design of radiators - very few people will be satisfied with ugly cast-iron monsters of poor form, who in Soviet times were everywhere. I want the batteries to harmoniously complement the decoration of the rooms - today it is quite real. 6. The last parameter is the duration of the service. There are already no comments. The less often you have to tinker with the installation of these bulky and quite expensive devices, the more profitable the owners. Steel radiators are distinguished by their low weight and thickness. Good heat and a small amount of water make them economical and efficient. Yes, and they are inexpensive. But according to pressure, they “let us down” - only 6-8 atmospheres withstand. They are not suitable for apartments, period. A tubular steel radiator, they have a wide variety and differ in both design and color. These radiators look good, and 190 watts of thermal power pleases the consumer. However, wait, the inhabitants of the apartments - too early to rejoice. Hot water with chemical impurities and high acidity quickly “consumes” the batteries from the inside. After all, aluminum is too active. Yes, and with great pressure, he can not cope.The average working pressure is up to 16 atmospheres. A hydraulic shock can destroy even a completely new aluminum radiator. Aluminum radiators have a very attractive appearance and can give off heat just like air heating and convection, but are absolutely not suitable for an apartment. 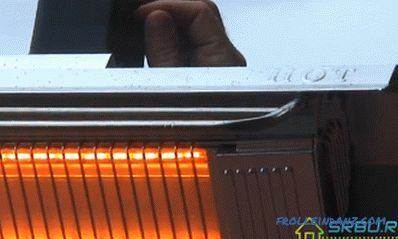 This is one of the newest developments of heating devices. Such radiators are called bimetallic - because they have two metals. 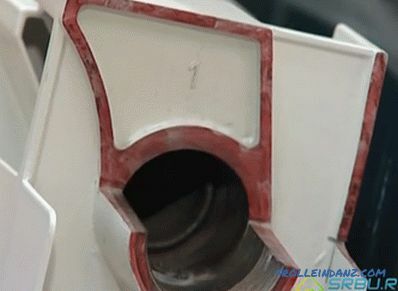 This can be, in particular, aluminum and steel, or aluminum and copper. A ribbed figured body is made of aluminum alloy, and inside is a core of steel or copper. Manufacturers ensure that such batteries last for at least forty years. For an apartment, they are suitable for all indicators, as you can see. They can even withstand temperatures up to 130 degrees. 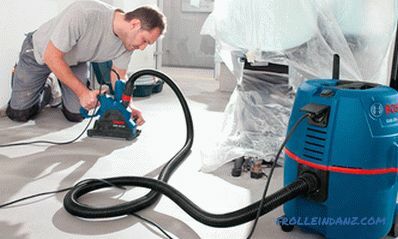 Their working pressure is stated up to 30 - 50 atmospheres, depending on the manufacturer and model. With them, you can stop being afraid of water hammer. Anticorrosion exterior and interior primer makes batteries durable and resistant to damage. The low weight makes mounting, carrying and transporting such batteries easy. Their appearance is pleasantly caressed to the gaze - beautiful white or colored panels are much more aesthetic than the usual form of cast-iron "accordion". Alas - not everyone can buy such an expensive device. And if you are offered something similar at a reasonable price - do not believe it. Fake a slip. If we are to buy, then the products of proven brands - the Russian company Rifar, Italian - Sira or Global. There are also quite good Chinese manufacturers. They, like the Russians, have a slightly lower price than radiators from Europe. Fifty years, no less, it is measured to live such a battery. Some manufacturers of new products claim in vain that it is high time to forget about this “old stuff”. For a long time thinking which heating radiators to choose for an apartment, many stop on cast-iron batteries. Oh, they do not "throw tricks" in contact with dirty domestic water in the heating system. This metal is chemically passive, and it is not afraid of either high acidity or the presence of chemical additives in the coolant. And no abrasive will damage the thick walls. So the cast iron for the apartment (especially in the old house) is very good. When casting water from the system during the summer period, cast iron batteries do not rust — this is a significant plus. A large heat transfer area is another plus. 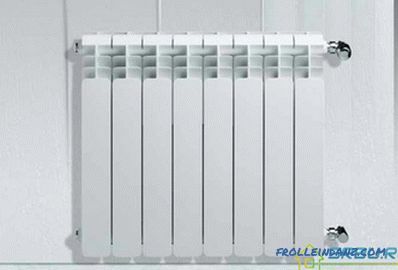 These radiators are, of course, which causes some inconvenience during their installation. Well, yes, cast iron cannot be a priori easy, but this weight turns into a large wall thickness, giving the radiators the desired strength. Having once installed cast-iron radiators (and specially trained people will be engaged in this - plumbers), you can forget about replacing them for many years. 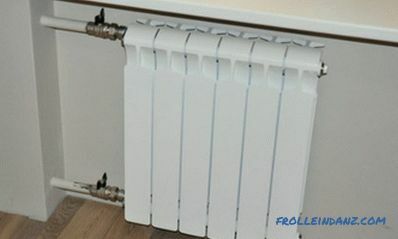 The appearance of cast iron radiators today is no longer as miserable as it was in Soviet times. Very externally attractive figure casting batteries appeared, performed in the “retro” style, which harmonize very well with the refined rooms. 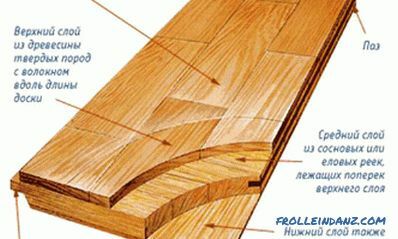 For example, mention may be made of products from Roca and Konner. True, the cost of such wonderful batteries is quite high. More budget are Ukrainian, Russian and Belarusian models, many of which must be painted before use. But they also look quite decent, their design fits into the interiors of modern apartments. Now it’s probably easier for you to decide which radiator to choose in the apartment - there are only two of the four options considered. As it turned out, neither the steel nor the aluminum radiators would be able to withstand the tests of either an aggressive domestic coolant or pressure drops. So, there are bimetallic and cast iron devices. What exactly to buy, look at your budget, as well as the characteristics of specific models. However, here you can give a couple of tips. 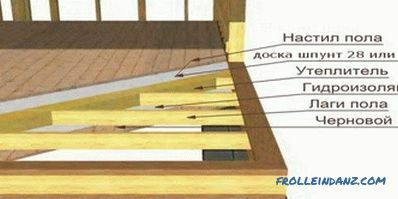 In old houses (for example, "Khrushchev") it is quite possible to put iron products. If you live in a high-rise building, where the pressure of the heating system is higher, then it is better to take bimetallic radiators. If the predecessors of your future new batteries are made of cast iron, then you can opt for either of two options. Both bimetal and cast iron will do. If you are going to replace the batteries made of another metal, then change them only to bimetallic.